South Australia's blackout apparently 'triggered by the violent fluctuations from the Snowtown wind farms' | Watts Up With That? It looks like a natural disaster but brought on by the fragility of the South Australian power system caused by the size of the variations in wind power. The failure is most likely to have been triggered by the violent fluctuations from the Snowtown wind farms (Figure 1 and 5). Shortly after 3 pm there was a loss of 200MW with a partial recovery some twenty minutes later of 100MW. The total wind farm supply for South Australia also shows these variations (Figure 2). This would have put a shock to the system for frequency stability at 50 cycles per second. For most of the day the local gas fired generators were only supplying 100 MW (Figure 3) with the balance to match demand with supply coming from Victoria. But the local generators started to increase and vary their output with first a 150 MW loss at Snowtown just before mid-day and then 50 MW variations that followed. Shortly before 3 pm the Hallett wind farms lost and then recovered 70 MW in a 20 minute interval (Figure 4 and 6). This added to the final Snowtown wind farm 200 MW loss. This detail is shown in Figure 5. So the system instability could trigger Victoria shutting off the link to South Australia and the blackout followed. The physical network may not be very robust as can be seen in images of broken pylons. Transmission lines are expensive at $1 to $3 million per km. Each wind farm must be connected to deliver maximum power to the network even though its average performance might be only 33% of maximum so connection costs may have been held to a minimum.. There are people who regularly comment on this site who are experts in engineering grids, and they should be able to opine on the difficulties of relying on intemittent power in not crashing a grid. Good coverage of this issue at JoNova’s. With a user base heavily biased to Australia they have more informed comment than is often found here. The failure is most likely to have been triggered by the violent fluctuations from the Snowtown wind farms (Figure 1 and 5). A pretty baseless claim without some deeper knowledge of the circumstances and a good engineering understanding of the network. I see no validity in making such claims based on eye-balling a few graphs that have only 5 minute resolution. Why is this “most likely” ? Perhaps thousands of lightning strikes and 22 pylons going over could be factor too? This is the kind of BS claim that this site rightly slates climate alarmists for making. Is it for some reason OK when slagging off wind farms? This lightweight “article” was not even worth posting. Thousands of lightning strikes and transmission problems from storms happen all the time, yet an entire state’s grid has never gone down. This is exactly the scenario that many people have been warning about, on account of the shift to intermittent and unreliable energy sources. The Deeper knowledge is that most of the power is generated and used south of where the line went down. Another line bypasses the area. The interconnector to baseload power from another state is south of where the line went down. Extremely poor engineering if the line going down could have blacked out the state (not to mention the the pictures show little damage to a nearby fence and crops so the pylons went down in strong but not tornado like winds). This report says 15 of those 22 towers were actually damaged after the blackout. Just what is the DESIGN full load power output from THAT windmill in THAT picture ?? We see these wind farm pictures all the time, but nobody ever tells us what the unit size is of these things. In California we have wind generators that run the gamut. You can get maybe a 50 watt unit to put on your roof or your tool shed, but we hear of megawatt or even 5 megawatt trubines. We have acres of little ones that look like they might give you one KW each. So how big is that big boy in the picture with the grease monkey standing on the top ?? I can’t imagine ANY energy source (in quantity) that is as intermittent and dependent on its original energy source power level, as is wind energy. The margin between starting wind threshold for phase lock, and the overdrive damage shutdown threshold, is just way too small for a dependable source of base energy. If the power goes as v^2, then a 2:1 wind change goes from 25% power to full power; or from full power to a 4X overload. If it really is as v^3 then it is 12.5% of capacity to 8 X overload. I’m still not sold on the cubed bit, because the rotation speed has to be regulated to stay in phase lock; but even a squared wind speed relationship is too much variation. I have to believe that the “wind climate”, if I can call it that, is at least as iffy as the “drought climate” that currently is giving California fits. PV solar is probably more dependable that wind energy. Both could be used in niche applications, but relying on wind for base load power is to me, insane. 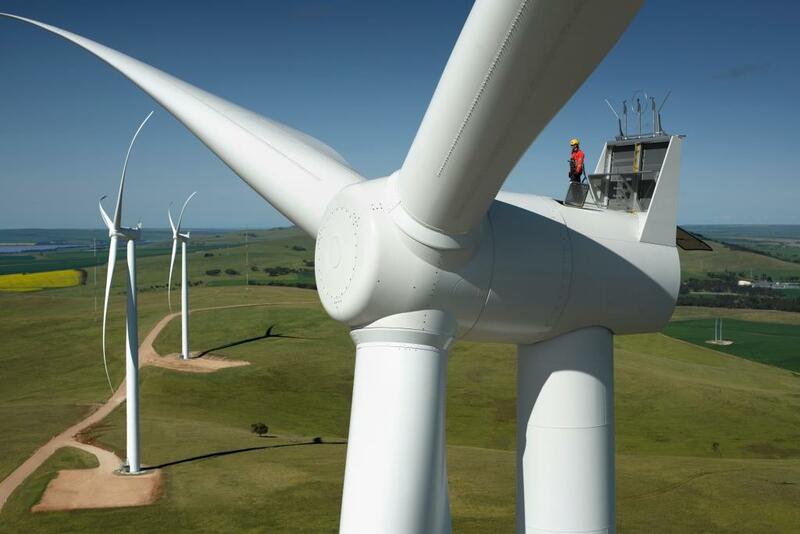 These big wind turbines are not phase locked, the generator is a large electric motor powered by the grid to get them up to speed and control the blade angles and direction they point. They generate 3phase that is converted to dc this is then inverted to ac in phase lock with the grid. Very inefficient and on many day they consume more power than they make, this power is not metered and the cost is worn by the real power generators. They then get a premium for the green power and all the costs come back to the family home. South Australia has the highest cost of electricity in Oz. 1. The cartoon has South Australian significance – possibly not picked up elsewhere. 2. A regional blackout was predictable and was predicted by the network manager and a think tank called the Grattan Institute. 1979 or later was the predicted date. 3. South Australia has been generating 40% of its electricity (on average) from wind and solar as a result of the combination of state incentives and federal government incentives (called the RET). Nowhere else in the world does any country/region operate such a dangerously unreliable and unstable network. Readers will be aware of the technical problems of blending variable non synchronous renewable power into a network which derives stability and reliability from synchronised power supplied from coal, gas biomass or hydro. South Australia has no hydro, no biomass and almost no coal burning generators. The pricing system used in the National Electricity Market rewards low marginal cost producers (wind) and forces out higher marginal cost producers (coal) even though the long term cost of wind is higher than coal. >This left the only available supply coming from gas generation which proved to be insufficient. It was never designed or expected to carry the load when wind, solar and both interstate connectors went offline. The network collapsed. What remains to be explained is why the whole network collapsed. Most of the population of the state is concentrated in the capital – Adelaide. If the limited power which was available by gas generation had been directed to bypass Adelaide then maybe power would have been maintained in the regional and rural areas of the state. Perhaps that was a network design fault. 4. If there is no whitewash then we will eventually find out what really happened. Three separate inquiries are underway. 5, The politics are fascinating. Australia has a constitutional arrangement whereby the central (Federal) government has defined powers and the states have defined powers. The Federal government has no constitutional power to mandate the modes of electricity generation in the states. So the Federal minister has to try to negotiate with the state premiers. Several of the states have ambitious renewable energy targets which can only lead to the instability and unreliability demonstrated so recently in South Australia. 6. My current opinion is that with present technologies large scale renewable energy projects are a folly. Perhaps improvements in technology will change that perception. You mustn’t allow these facts to distract you. The SA government and all the progressive news media in Australia has said that it has nothing to do with the wind farms, so that is settled. The facts are irrelevant. Greens leader Adam Brandt has declared that the state-wide blackout (some consumers are still without power) was nothing to do with wind energy reliance and in fact “… we need more renewable energy to tackle climate change, not less …”. If 40% reliance on ‘renewables’ won’t stop freak storms that blackout a whole state for days, what percentage will? 100% would be fun to watch. Recovering a black network on wind power would be quite a feat, akin to magic. That’s the usual formula. If a ‘policy’ is shown to fail, the solution is to have MORE of the failed policy, not less. The funniest thing is watching all those responsible fall over each other to back-pedal wildly and claim the storm was natural, in order to look typically helpless in the face of any natural disaster. Any other time it would be an AGW issue, where they’d have to do something about it because they prophesied and promised they would. In the meantime, Will Steffen, among all this AGW denial from his paycheque signatories is desperately blubbering away saying the storm was CO2 related and we’ll see more of them in the future. What a mook. Of course he forgot about similar storms over the last 100 years in all areas of Australia. If he had just spent more money on the climate scam renewables this never would have happened. Now whenever anything bad happens, it’s because we didn’t spend enough in the first place, even if we spent everything needed at the time. Yes. How many of those photos of fallen steel towers were taken in South Australia this week? until I get better information I’ll say none. There were said to be 23 pylons destroyed by wind. Thing is, if one leg on a tower goes on the upwind side, the wind will push the tower over. As it goes, until the power lines snap (assuming they do) they will provide a lateral thrust on each of the adjacent pylons to add to the wind pressure, and then plausibly one or more of the adjacent pylons goes. Hence it is feasible that 23 adjacent pylons went. Also, it was reported that trees were uprooted during the wind gusts, it is plausible that one or more of the pylons were struck by trees – which may or may not have been estimated for in the pylon design. A case of wait and see for the accurate reports of where the damage occurred, and the report on why. When folks are trying to fake low cost of production and transmission, concrete presents a real non-concealable cost. The pylons were built on the cheap in 1960 with a forty year life span, say no more. We must assume that ISIL and other unfriendly powers are paying close attention. Who needs ISIL when we have the UN. Who needs the UN when we have Barrie Harrop in Adelaide? Is Barrie still commenting at WSJ.com? I quit the WallStreet Journal last month after they went in on Hillary. ISIS already has the example of the Great North Eastern American Blackout from way back (babies conceived during the blackout – there being nothing else to do – must be reaching adult hood by now). Plus also a program on NCIS where they eventually caught the terrorist before he blew up the pylon which, if taken out, would shut down the entire NE again. My understanding was that 22 high voltage towers got blown over by the storm. As much as I despise Big Wind, seems to me that would be a more likely causal factor. When you abruptly lose connection to even a few major power feeds, the whole grid goes massively unstable and the circuit breakers blow left right and centre, otherwise massive physical damage occurs and interconnected grids can also be taken down. But the BOM shows that the 22 were subjected to wind speeds 70 k’s and gusts up to 93 k’s. The infrastructure failed at relatively low wind speeds of less than a category one cyclone. As a point of contrast, the same cold front across Tassie recorded wind speeds of 73 k’s and gusts of up to 91 k’s – no power failures or downed transmission lines. Yet somehow the ‘authorities’ have deemed this a ‘Super-storm’. The article confesses sort of that they scrimped on t-line investment during the design for max output but normally get 33% discussion. The per kwh t-line cost if sufficiently robust for wind loads would otherwise be too high. Thus they built crumple towers. What’s a couple weeks without grid service among friends? They built weak towers to keep t-line costs down. It is admitted sort of in the discussion about design-for-max-get-33%. Putting intermittent, unreliable power sources in your power grid can only reduce resilience. Lesson: There is a real cost to reducing carbon carbon emissions, and South Aussie has just paid its first installment on a multi-decade mortgage of its future. Everything is cheaper — until you have to replace it. You seem to imply wind requires more transmission than an otherwise non-distributed power system, which I think is right. Because wind farms (even big ones) have lower capacities than conventional coal/gas/hydro/nuclear sources. Wind is more ‘distributed‘, as they’re forever telling us. In summary: there were a lot more towers that could fall over and they were more cheaply made. Yet the loss of even 22 transmission towers should not have caused the entire grid to blackout. A resilient system would’ve sacrificed a proportion of users but kept the majority connected. For example, in 2004, 2000 MW of transmission was instantly lost from the Australian grid, which responded by cutting off a large number of users. As explained here. Yes, the first thing that struck me about the photos of the downed pylons was how light weight they looked. I assumed that they were just local lines but it now seems that they were major feeds. However, the fact that was some partial restoration shortly afterwards suggests that this is not just a case of downed pylons which would require substantial work and importation of emergency temporary pylons. A lot of the problem seems to be automatic trips switches probably triggered by lightening strikes. Widely distributed networks of relatively small production power means more exposed wire per GW than a large thermal power station built nearer to where demand is. This means greater exposer to this kind of weather risk. I suspect that as with the inadequate sea defences at Fukushima there has been some market driven, cost cutting where risks assessments and vulnerability have minimised to keep costs down. As someone pointed out, the same winds did not bring down pylons on Tassie. They were not the same winds. The storm passed well north of Melbourne – there was nothing here. I’m not sure what the Tas evidence is supposed to be. Nor the claimed wind data near the pylons. Cold air has much more force at the same speed as warm air. There are more molecules pushing per m2. All knowable at the design stage. No, it must be a flaw in wind power. We should ignore the downing of 22 transmission towers and 130,000 lightning strikes in the region, otherwise we can’t support our fractionally true argument. (/sarc). Slipstick,, I see your sarc at the end of your comment, but I still not getting the proper meaning and intention of your comment and the actual point made. But anyway, what should not be ignored is not only the actual evidence pointing at a very high volatility and fluctuation of power in the grid due to the volatility of power input by the wind farms but also the fact that in the 28 sept., in a stormy day (or the prospect of it), actually the SA electrical network did heavily rely and depended in a considerable input from unreliable sources, which seems to have being operating at max………while actually the opposite should have being the case, the case where all the necessary precautions and preparations for such a condition were taken. You see, somehow, for some reason, instead of decreasing the input from wind farms (the unreliable points) and increasing or allowing the increase of input from other points, the reliable ones, and therefor increasing the stability, strength and resilience of the grid for such a condition, the opposite seems to have being happening in this case. And that is what happens when heavy relying and depending on unreliable sources of energy during a storm. That what happens when instead of reducing the input from unreliable sources of energy, “you” in contrary do actually increase that input and the dependence on it during a problematic period, like a stormy one. The question to be answered in this case is ; why, why was this allowed in the fist place!? Could it be that it was dictated and forced directly by the highest office in SA in an attempt to turn a “villain” in to a “hero” over night by exploiting a given condition! You do not build transmission lines to handle 33% capacity, the wires have to be able to handle full power at any time. However, you can build towers that are not designed to handle higher wind loads to save money. Slipstick, there is nothing wrong itch wind power. Just let the grid operator optimize the generation in the grid at any instance based on reliability and cost basis, without any preferential treatment. That will be beneficial to the society and the environment. Then they should have been spending their money building a stronger system instead of wasting all the money on wind farms. JULIA Gillard has unveiled a plan to reform the electricity sector, vowing to save households up to $250 a year on their power bills. Ms Gillard said under the current system there was a “perverse incentive” for electricity companies to keep “gold-plating” or overinvesting in poles and wires in the system and keep passing on the full cost to consumers. Perhaps the power companies took this on board and reduced us to a silver or bronze-plated system that has now failed. Thank (place your deity of choice here) she is gone but the foolishness caries on. My power went off around midday Wed, lights in half of the town (not mine) were back on around 9PM and my power was restored at 1:30PM Thursday, all courtesy of the most expensive power in Australia. David, I doubt that circuit breakers “blow” LR&C. The control system can certainly shut down systems to prevent destructive interactions, but I doubt that the grid is just left to passively blow itself to smithereens. This is akin to that garbage on the other thread about a solar storm blowing up megawatt power transmission components. Take a look at your standard 300 ohm ribbon FM radio dipole antenna, consisting of two 22 gauge seven strand wires about a half inch apart as an example. Perhaps a 12:1 spacing/diameter transmission line. A 200 KV long distance transmission line is maybe 100 to 150 feet off the ground, so it is 200 to 300 feet apart from its ground plane image, so it would be a 300: ratio if the damn wires were a foot in diameter. I have no idea how big those wires are but I doubt it is more than maybe two inches. So each of the three phases and its image give you a parallel wire line that must have a characteristic impedance well over a Kohm (work it out yourselves). Then you three of them in parallel in the common mode view. And you couple into that loosely from a 377 ohm source (free space) etc etc. Power grid control systems take power grids down; often due to a local defect like a line down or toppled tower, but that is a control algorithm problem. Hey these systems are programmed by the same people who gave us Microsoft Windows, and write the traffic light control algorithms, or run trains into each other on railway lines. They also program our internet security functions; and what a great success they have had with that. But it does sound like South Australia has a problem on its hands. And I can see how a tower failure string can exacerbate a continuity problem that wind trubines have, but agree with others; the initial straw on the camel might not be a windmill. Agreed G, but if the d@mn windfarms didn’t require so much extra spread out grid infrastructure, the chances of “acts of God” (insurance speak) would be proportionally less. I see “grabbing electricity out of thin air” as something that would technically work smoother at the consumer end of the grid. Extra grid structure and its associated upkeep is only an encumbrance to the consumer. Besides, the home versions of wind and solar don’t create as much environmental impact. The only reason that I can see why most of the government money goes to the grid instead of consumers who wish to be self-sustaining is that governments are protecting the Utilities from the drops that they would see in demand and therefore, sale of power. 2) They normally run a SCADA system with a series of interlocks that isolate power to segments. So if a power pole goes down on your street, they isolate your street segment at both ends. Once it is fixed, tested … they open the interlocks and power flows again. 3) these operate in a combination of auto & manual – normally auto, but there is a control center somewhere that can give a manual override before the auto kicks in. My question is if it was a pole problem, how did they get the grid back up in part so quickly. 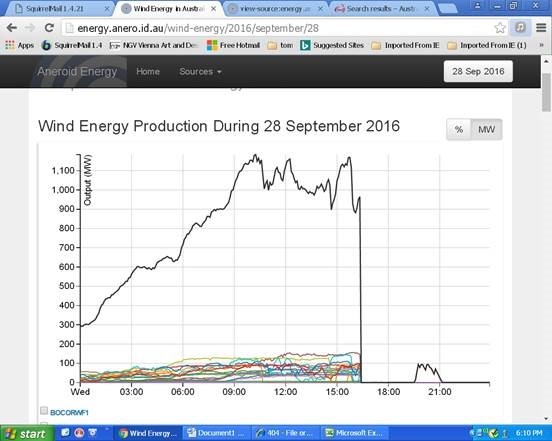 My initial reaction is, it hard to drop 400MW of wind 40% of supply in a short period and not have issues. If this is a pole problem or not not, dropping 40% of supply in a short time frame will cause a frequency response in the system -> this may trip the safety -> SA come tumbling down. @Greg . . surely they use auto-reclosers. You know the ones that disconnect for a few seconds then connect again. They go through three cycles like that because most faults are transient, like lightening strikes or tree branches and the like. I like the name “Snowtown”. Snowtown has a gruesome history, I won’t elaborate. Except that it is somewhat ironic that Snowtown has a ‘big blade’ (a wind turbine blade) on display. Not a pleasant story, I don’t recommend reading about it just after eating. My father was on a steam turbine engineering team in the ’50s and I remember one of the hot topics discussed with his colleagues was the governors that kept the spindles producing 60 cycle AC. So I’ve been wondering how in the world wind mills manage to produce a steady specified speed given that wind velocity isn’t a steady energy source. I guess I got my answer, they don’t. wind turbines run through electronic inverters to synch them to the grid. Each generator is electronically regulated. The windings on the rotor are energized to produce the correct voltage and frequency from the stator. The intimate control of the windings’ voltage is irrelevant when the speed of the gears exceeds the operating temperature of the lubricant. Just when wind turbines are getting efficient at high wind speeds, they have to have their brakes applied or they will fail catastrophically. These are the least green energy sources on the planet for virtually every reason:large land footprint, extensive infrastructure requirements, substantial maintenance requirements, non-recyclable materials, rare material usage, shorter than advertised lifetime, erratic energy production, massive energy management challenges, huge environmental impacts, bird killers, bat killers, human health impacts, and dangers from turbines failures and ice thrown in foul weather. Yep, they are darn near close to perfect; perfectly useless. If they were that great, free enterprise would already have using them. They are so horrific that only government can make us build these by mandate. We have tens of thousands of broken turbines around the the world. It is time to admit they are another HUGE government/political/UN boondoggle. [Wind “Turbines”]It is time to admit they are another HUGE government/political/UN boondoggle. Higley , “We have tens of thousands of broken turbines around the the world” how do we know this? does someone keep track? at first glance that number seems perhaps exaggerated. The responses to your question (below as I write) are incompetent. There may be DC wind-generators inverted to AC but the expense and inefficiency would only be characteristic of green power. An AC generator must operate in speed/frequency synchrony with its grid. A windmill varies the blade angles to control power/speed. I suspect that the blade angle response rate was inadequate in this case of an overcomplicated system. My qualification to speak so is as an operator of a 4 MWe mobile electric plant powered by a 100 MWth steam plant. The ‘grid’ was of two steam turbine-generators and two DC motor-generators. Small wind turibnes (10Kw) were built with speed governors in the 1970s. The blade pitch was constantly adjusted to keep the frequency output stable. These systems did cause AC frequency changes when the generator was connected to the grid. That technology was abandoned a long time ago in the wind turbine industry. Modern wind turibnes have high power electrical converts much like the units solar farms use to convert DC to AC. In the case of a wind turbine the The generator produces wild AC power of varying voltage and frequency. The power is converted to DC and then converted back to AC by solid state power electronics. While the wind turbine may spin faster or slower the frequency output stays the same. Ay, and there’s the rub! If a wind turbine goes off line, in order for it to come back on again the power electronics must be able to provide the correct frequency at the correct phase – and the input from the grid is essential to this, no input and it would not know what to produce. Wrong phase and I suggest you have a massive short – or something like that. Wrong frequency, and nothing lines up – when it gets to the wrong phase – same result! If the input to the power electronics is varying in frequency because the grid is unstable it would be very difficult for the power electronics to line up correctly – could be done, I suppose, but who would normally design something to provide this? I visited the Snowy Mountains Hydro electric power station. Engineers said that they could determine the exact time that “A Country Practice” finished because two million housewives got up and put on the electric kettles for a pot of tea. The turbines were spinning at the correct speed but not under load (driven by the alternators which were on line), but as soon as the extra demand came on the valves were opened and water gushed through the turbines to provide power. The thing is, they had to be spinning at the correct rate so as to be able to deliver energy to the alternators which were on line but not on load. Similarly turboalternators from a coal or gas fired plant would have to be ready spinning to be able to provide instant power. This would mean you had a substantial rotational inertia to ensure that correct frequency was maintained. With no coal fired power stations, and with the gas fired station shut down, there would have been no rotational inertia in the system (except via the interstate connectors) to ensure correct frequency was maintained, and so there would have been no way to ensure that the system frequency did not fluctuate. For small fluctuations, the balance would have been maintained using the two interconnectors – from Victoria and NSW. In the storm, the fluctuations could have been large, and if the limits were exceeded, the interconnectors would have shut down. This they did, protecting the Victorian and NSW systems from the rampaging SA system. With the Port Augusta power station also on line, it is probable that the frequency variations would have been greatly reduced, and there would have been no problems until the pylons were blown over. Reminded me of an electric clock we used to have. It was driven by a small electro magnet which powered a piece of iron with teeth on it (the ‘comb’). This was next to a similarly toothed iron wheel. The clock was started by pulling a short cord which started the toothed wheel spinning. If you managed it right, the teeth on the toothed wheel were attracted to the teeth on the comb. As the teeth on the wheel passed the teeth on the comb, so the reverse phase from the electro magnet pushed the toothed wheel round, and so on. Get the toothed wheel at the right speed and right relationship to the toothed comb and all was well. Otherwise, try again! Your Fig 3. Made the hairs stand up on the back of my arms. When the whole idiotic hare- brained thing fell down…they brought the coal fired generators back on line…watch them rise to the occasion and take the strain! That is why there is rabid insistence from the ‘greens’ that any ‘fossil fueled plant’ that is shut down is immediately and irrevocably destroyed. The Malthusian ‘greens’ really want a total energy failure in the ‘first world’. Anyone identifying as a Green and advocating such should be disconnected from the coal grid to fend for themselves – if it were possible. ‘Nuff said. Olaf: Agreed. If one is for renewable power, they should live with it. Not attached to the grid in any way. Olaf, I have a neighbor who is off the grid (no utilities), but only to keep from paying hookup and meter charges. He told me man-made climate change is hogwash. Good thing because he burns wood and has a large carbon footprint for one person. Have a beer with him on me, Pop. See the graph ramping up? 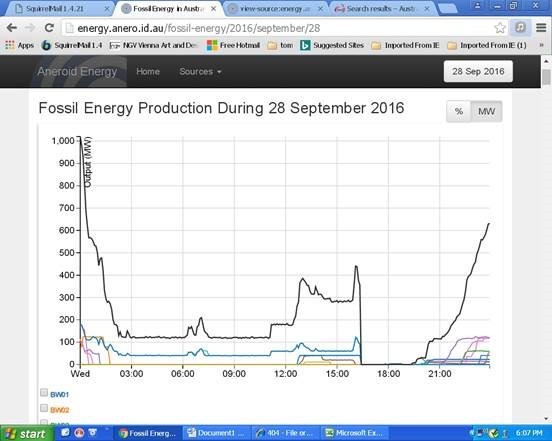 That’s energy production resuming from fossil fuelled sources. Or….are you ‘denying’ that the graph is accurate? “… Power supply continues to be safely restored across South Australia. Victoria via the Heywood interconnector. The Murraylink cable was returned to service at 0154 hrs… “ (Australian Energy Market Operator). Power from Victoria is generated, overwhelmingly, from brown coal. “Overall, the studies highlight the increasing importance of the Heywood Interconnector in the secure and reliable operation of the SA power system …” Australian Energy Market Operator Report Feb. 2016. @Stokes … so brown coal generators in Vic aren’t coal-fired? Doos! The victorian generators were never off line. This really is the strangest quibble I have seen for a while. The Victorian generators were off line when you consider the relevant line is the line to Adelaide. Not sure what point you are trying to make, Nick. Not mentioning that the reason for that is the generating plant itself has been deliberately demolished. McIntyre is absolutely correct – you’re a racehorse caller. Clearly claiming that SA brought its coal fired generators on line. In fact, the connection via Victoria is to the national grid, which gets power from a variety of sources, including hydro and wind. I might add that the reference (coal fired) was to Fig 3, which is actually the local generation from gas/diesel. LOL, when I read that I thought Nick was describing coal power as “victorian” technology, not that it was power coming from Victoria. I think the commenter was trying to refer to gas powered back-up generation near Adelaide. I recall reading that only one such generator was in production before the storm hit. Since they new the storm was coming well in advance, may be they should have anticipated some problems and had the others in a near ready state in anticipation of some outages due to the storm. What is the point in having back-up capacity if it is not ready when you know you have a “super storm” on the way? Unless you guys are power engineers that work on that particular system you don’t know what they did. Lots of unqualified rambling on this post. The one thing I do know for sure from talking to engineers at actual power companies is that renewables are very hard to tie into the grid without screwing up the phase angles and synchronization. I’m sure wild fluctuations and damage from the storm both contributed. 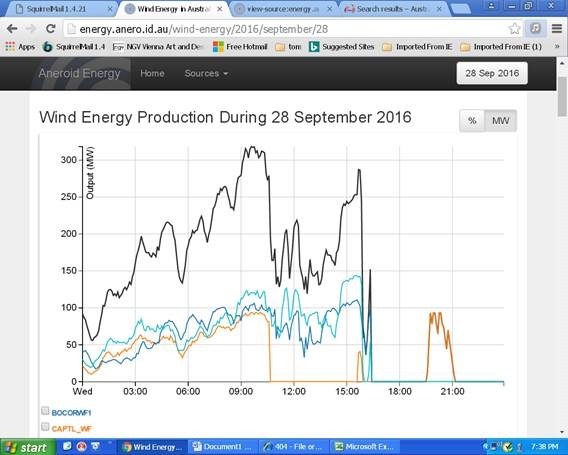 Check out what happened to North Brown Hill – dumped 90MW just before 3pm. Only managed to recover 3/4 of its previous output. Clements Gap took a lunchtime break before slamming 45MW back onto the system just before 3. Waterloo also went from 90+MW to 20, then back to nearly 100MW during the critical time. The theory with multiple large wind farms is that the geographical distribution of generating capacity smooths any short-term fluctuations (i.e. wind gusts). But clearly that breaks down in situations like this where multiple wind farms are being pushed beyond cut-out wind speeds simultaneously. Suddenly you’re getting several large installations all going from maximum output to next-to-zero and then back on again. Without fast-acting backup generation, grid stability is at risk. Just speculation from someone with no evident special expertise or knowledge. I haven’t speculated on the reasons for the failure, though I have noted that 22 pylons collapsed – an unusual event. I listen to what the people who run and know about the network say. Interesting.. I’ve just had a Telstra guy out to repair a trashed underground cable.. questions were answered with ‘no idea’ .. ‘not my department’ .. ‘I just do my job’ .. ‘don’t know’. I saw this a lot when dealing with companies and departments across the last 30 years. Photographic companies couldn’t answer questions on their products, didn’t know the designs. I trained at one point to repair wide format printers, the company lecturers didn’t know how things worked.. the tech division were board swappers. Mechanics are the same, in fact most technical positions these days seem filled with board swappers or instruction manual assemblers, and there’s few of us old school types left who can carry out real component repairs or know how the systems were designed to work (said after just repairing 3, $2000+ amps that both authorized and independent repairers had advised the owner were un-salvageable and not worth repairing – he was keen to pay *anyone* to fix them but no one would. I found 3, 20c ceramic capacitors had failed on ludicrously inane pre-power supply designed circuits. The experts failed miserably. I found enthusiasts are often far better informed than folks for whom it’s just a job that pays their bills. Karl: Perhaps that is why the experts are always the ones who are surprised. Ok Nick, since you want to play that game, would you agree that your comment applies to Tim Flannery, John Cook, Bill Nye, Al Gore etc when it comes to climate science? Choose your next words carefully lest you expose your hypocrisy or should you choose not to reply, ill take it that you concede my point. I’m not aware of any speculation by those people on breakdown of electricity supply networks. And your reply to his actual question is — ? I don’t recall Nick supporting idiots like Gore and Nye the science lie in the years that he has been commenting. He made a reply relevant to the discussion. If you want to broaden this to a debate of the whole climate issue, it may take a while. It’s what Nick does not say Greg, is the mark of of a person. 1. Almost all Wind Turbines have High wind shut off and automatic feathering implementation to prevent catastrophic destruction. They are not designed to withstand 50, 90 MPH wind and produce power. Most shut off about 25 MPH. When a tornado/cyclone comes through a wind farm, due to the close proximity of the turbines, they will all be shut down within a matter of minutes. 2. I have personally experienced the complete loss of all power from a substation from the sudden loss of just 50 MW of power, when a generator unexpectedly tripped. Been there, done that. Was in the control room when the generator tripped. We were starting a 10,000 HP motor (7.5 MW load). Although we told the dispatcher, he failed to increase the voltage for the sudden load. The voltage on the generator dropped. The substation voltage dropped below the low-level limit. The HV circuit protection breakers for the substation did their job and isolated the substation from the rest of the grid. Thus every load on that substation (app. 5 sq miles) was BLACK. Since the operators knew what caused the trip, it was simple for the dispatcher to bring the power back on. Wind turbines do not “Black Start” they have to have the pumps running to pump oil for bearings, They need computers, weather station input to tell them where to aim. Hydraulic pumps to position them into the wind, etc., etc, etc Some even use grid voltage for the voltage to make the magnetic flux. Without a grid this stuff is not running, other than some vital battery backed up loads. Thus they could not be restarted. The ones I am familar with in the US shut off between 40 and 60 mph. Some can restart on their own, if wind speeds drop, while some cannot. In Wyoming it is not uncommon to see the turbines not turning due to high wind. We often have sustained winds over 30 mph (at least in the past, not so much this year) and at 400 ft off the ground, I’m sure the speed is higher. I’ve seen the turbines shut down in high wind. Some days, none of the 11 I can see from my window are turning, even with 10 to 20 mph wind. They seem to come on and go off without an logic. I have to interject here. Is exactly what happened with the link. My dad works for the grid side here in Victoria. We have been discussing it. The link is designed to shut down, when the energy grid on either side is unstable, it does this to protect the state that isn’t unstable and causing both states grids to collapse. The Vic-Tas link is the same. This is also what in effect happened, The Victorian side detected the instability and collapsed the link to protect the Victorian side. It happened before any of the pylons came down. The link going out alone, wouldn’t have caused the blackout tho. No Nick you are wrong again. At 16:18 AEMO issued a notice saying SA was islanded from the grid. That means the undervoltage/ overcurrent protection on the Heywood line worked and the line was “shut off” .As I explained down the page, this would cause the grid to go into underfrequency and collapse 6 minutes later. The Australian Energy Market Operator (AEMO) advises that at 1618hrs Australian Eastern Standard Time (AEST) on Wednesday, 28 September 2016, a severe storm damaged transmission and distribution electricity assets in South Australia, leading to a state-wide power outage. Initial investigations have identified the root cause of the event is likely to be the multiple loss of 275 kilovolt (kV) power lines during severe storm activity in the state. Approximately 1,900 megawatts (MW) was being consumed in South Australia at the time of the power failure, with South Australian generation being supported by 505 MW of supply from Victoria via the Heywood interconnector, and 105 MW of supply from Victoria via the Murraylink DC cable. Those press statements are written by PR flunkies who wouldn’t know a generator from a boiler. They also have a political agenda. Talk to someone who actually works in power stations or a grid control centre. See what they say. I am not at work now so can’t get access to the time stamped data. However, the Heywood line tripped at 16:18. SA went black at 16:24 – so what happened in those 6 minutes? With regards to the power coming across the Heywood lines, the NEM 5 minute data shows the following: 1550:307MW, 1555, 503MW, 1600 582MW, 1605 517MW, 1610 444MW, 1615 419MW, 1620 430MW, 1625 339MW. The data shown definitely isn’t real time ( I’m not sure of the time delay) and the lines definitely weren’t supplying 505MW. At 16:20 103MW was showing as coming in on the DC line. So both AEMO and your comment 8:21 on 1/10 are wrong. Nick I suggest you watch this video before making any more comments. In that video, they claim that 67% of USA electricity is lost in transmission. Is that correct? I thought transmission was more efficient than that, with losses more in the region of 5%. Anyone have expertise in this area? In Alberta, the electric power consumer is often misled by our governments – of both conservative and socialist stripes -and cheated by our utilities. The Alberta conservative government just installed a multi-billion dollar DC line that is supposed to reduce line losses – but the AC-to-DC-to-AC conversion is about 5%, greater than the total line losses in our province, which average less than 3% – so a simple analysis concludes the DC line is uneconomic. Alberta also re-routed power from existing power lines to fill up the DC line – otherwise it would only run at less than 10% capacity. Now this DC line is part of our rate base, and consumers will pay for many decades for this scam. The next scam, this time from our new socialist politicians, is to retire our coal-fired plants that produce electric power for about 2 cents per KWh, and replace them with unreliable, un-dispatchable intermittent wind power – there is NO chance that this plan will work. Our current politicians claim the coal plants are dirty, but there is NO evidence to support that allegation – the air quality downwind is excellent. Our coal is low-sulphur and particulate emissions are cleaned up at the plant source. We have frequent forest fires upwind of our populated areas, with smoke from Alberta, British Columbia and the NW states of the USA. One typical forest fire does much greater harm to our air quality in Alberta than the total air pollution from one YEAR of our coal-fired power plant emissions – but why let the facts get in the way of another good electric power scam. Nick, can you explain to us all why QLD doesn’t have a total, state-wide blackout during a cyclone, or NSW doesn’t suffer from a total state-wide blackout during an east-coast low? I have to agree with you Nick. I have some knowledge of grids and grid control. Unless we have the charts that show the power and frequency from the node points, we do not know what happened. Most of this discussion is speculation. South Australia should be rejoicing that Gaia has granted them the rare privilege of an extended Earth Hour for their good works! But they don’t seem to be very grateful. I suspect Gaia will be granting many more of these unappreciated privileges to SA in future. This will all be part of the New Normal. Forget about those days when you had power 24/7/365 with an occasional flickering of the lights and a rare outage of a minute to an hour. The New Normal will be “expect a weekly outages, and occasional several day outages.” If you have a freezer, I hope it will keep food frozen for several days. Perhaps some of those ice packs will extend the length of time that a freezer can go without power. Some of the Entrepreneurs reading this should do some tests and design a 2 to 3 day freezer and refrigerator. The market will be here sooner than you think. Or Australia does like India and everyone has a diesel generator they start up when the lights go out. Well mine is a gas gen, which I can hook up to my house grid ( although I do downsize the usage to the fridge, freezers ( intermittently) the oil heater in the winter and a few low watt light bulbs. We have gone through 4 day outages that way and could from that experience do 10 day ones. We also have a number of battery LED lights that we place around the house and LED head mounted “walkabout” lights, easy peasy, just be prepared everyone but I’d sure would hate living in a city during a four – five day power outage!. No. There isn’t a new normal to have no power. I have a 12.5 kW propane powered auto-start generator for when the power fails as it often does. So do most of my rural neighbours. Wind power is completely unreliable. Any company that designs transmission towers that don’t stand up in what would seem to be a pretty normal high wind is looking rather incompetent. 100 plus km/hr winds are not unusual. Hurricanes can be over 200 km/hr. Surely they know the wind blows hard as that is why they put wind farms there. Looks like they were designed to fail. Wayne: “Looks like they were designed to fail” Truer words were rarely spoken. And who pays? …They were probably designed with the aide of people like Stokes…Just sayin’ ! No Nic, you are wrong again. It was the windfarms switching in and out that caused the line flows to go berserk. They have no inertia so that makes fluctuations even more rapid. Eventually, one of the swings tripped the protection relays and the system crashes. A line falling down causes a lot slower crash. I find that people like Nick Stokes who clearly have no engineering background to be the most gullible when it comes to the renewable energy scam. He wouldn’t understand concept like base load or how a functioning power source might have to be shut down for its own protection in the event of a collapse. People like Nick indulge in what I call ‘magical thinking’. Here is an idea – all wind and solar farms have to stabilize their power before they feed it into the grid. How they do it is up to them. 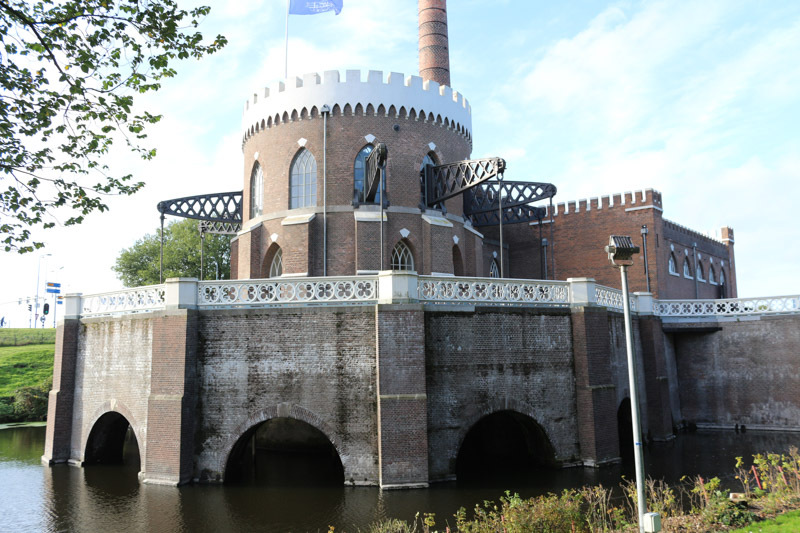 They can have huge battery banks or they can use the power to pump water into a dam. Whatever they like. When they finally have stable power they can sell it to the rest of us at whatever price the market will bear. If they cannot make it pay that is the end of the matter. At the moment they are pouring rubbish into the system and expecting everyone else to bear the cost and responsibility of cleaning it up and turning it into stable power. Excellent point. The oft-stated 3x cost of wind over fossil or nuclear electric generation still does not capture increased dispatch, transmission, maintenance, etc. costs. I don’t believe that is a fact. 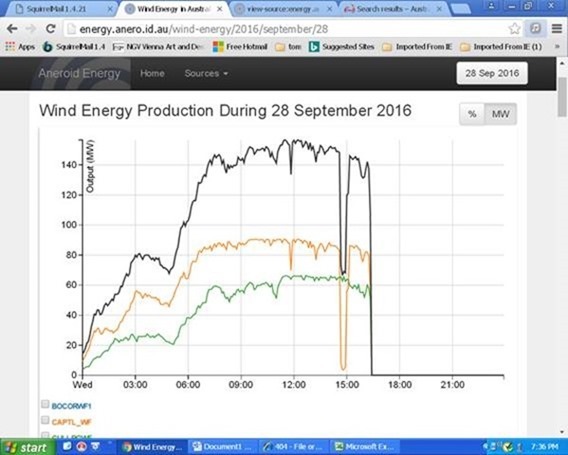 The AEMO says its was supplying 595 MW at the time the grid went down. There is a joint AEMO/ Electranet report published 19th February this year that looked at the risk to the grid of the coal units (Northern Power Station) shutting down. It anticipated that without the grid inertia from the synchronous units, management of the grid would be “very challenging” . Rather prophetic words, even if the failure wasn’t one of the scenarios they modelled. The power stations that were on we gas powered. There is a lot of issues with that if they all are sucking on the same pipeline. That is why grid operators prefer coal as the baseload because the generators are truly independent. No Chris it’s you who are wrong the problem had nothing at all to do with the wind farms whatsoever , I believe what the state govt says they wouldn’t lie or try to cover up anything . While the timing of the report Chris mentions makes me think it was more political than engineering, there is some truth to the idea that coal makes a plant completely independent of all others. Some coal plants in the US have/had their own coal mine sources. If the natural gas all comes from the same pipeline, there is a danger of losing all the power in the area all at once. It’s a good point about too much centralization of power, both literally and figuratively. I remember Denmark going to wind plants because of the oil embargo, and now they are dependent on several other countries for power when the wind doesn’t blow. So far, those countries are friends and allies. If that changes, there’s a problem. Independence in energy requires the energy not be centralized. The experts can’t make it any plainer than that without using expletives and calling Green power folks deniers and idiots with heads up their rectums. Compelling reading and yes the warnings were there for all to see , it predicted exactly the event on the 28th . The govt knew of the shortfalls so I reckon let the litigation begin . Technically both the AEMO reports were looking at the possibility that the Victorian interconnectors would fail and SA would be islanded. Without synchronous plant, there would be no inertia to the grid so there was no frequency stability (high RoCoF) and it would go black. The scenario that did happen wasn’t covered it was a black swan event, though that is really the wrong State for that term.. While the Victorian line (the Heywood interconnector) was still going, there would not be frequency excursions as the grid would be locked. What would happen is the voltage would go up and down, as the windfarms went in and out, making it very hard for the transformer’s controls to chase the voltage. The reactance of the equipment would be rapidly changing as well so alarms would be going off in all the control rooms. It will be interesting to see the timestamps of the protection operation. I would hazard a guess that with the voltage swings, and the lines failing, there was a undervoltage protection on the Heywood line as the trigger. There would then very rapidly be total collapse, as Torrens switched off on under frequency, and that was it. Last week the liberal government of Ontario announced that they were cancelling any further expansion of their renewable energy program. We are still on the hook for the twenty year contracts they signed with all the projects that have already been built. Believe me, if this government is backing off, then wind’s days are numbered as a viable means of subsidy farming. I missed that, thanks for calling it out. Ontario’s wind farms are a study in government insanity. They traded 3 c/kwh power from a variety of sources for 12 c/kwh wind. But even worse, they signed contracts with Big Wind saying they have to take EVERYTHING that Big Wind produces. So, when wind peaks, they actually generate more than Ontario can use. But Ontario has to take it anyway, and having no way to store it, the grid would explode unless they off load to somewhere else. So, they sell it into the US. But the states they sell it to negotiated a sliding scale such that a big surge from Ontario combined with a lower need in the US results in a price that actually goes NEGATIVE. So Ontario winds up paying Big Wind to generate electricity AND Ontario pays US states to take the excess power. And they were planning a $4 billion dollar expansion! To foul things up this badly doesn’t require a computer. Just a government. +100. Someone needs to tell Rachel Notley and Shannon Phillips in Alberta. Wayne @ 9:01 pm, Try telling those two ANYTHING, my god if Alberta doesn’t get rid of those two they’ll do more damage than Trudeau Sr ever did. Denmark has been doing much the same with its wind power for more than a decade. Again their wind power can overload their small grid, so they ‘sell’ it to Scandinavia, who can throttle back their hydro production and take the Danish wind power. And then Denmark buys back from Scandinavia on windless days. A nice arrangement, except that Denmark is forced to sell cheap and buy back expensive, while Norway and Sweden dance all the way to the bank. The result being that Danish electricity is the most expensive in Europe, and subsidises the price of Scandinavian electricity. This report is ten years old now, but it is still relevant because the situation has got worse, not better. Well put. And the green politicians down here (in the US) take that Rube Goldberg “low cost” power as evidence that wind is the power of the future. IDIOTS ! Yes. This is beyond stupid. I am ashamed to admit that I live in Ontario. It used to be such great province…. I think it’s more accurate to say that they kept the 3c reliable power (it’s all still there, minus a few coal plants they shut down, but what’s left still sells for 3 cents – you can see it on the IESO page) and then tacked 8 (+/-) cents of wind subsidies on top. So we are paying 12 cents, even though the commodity still only costs 3 cents. Of course the subsidy farm owners are laughing all the way to the bank. Populist energy policy and populist grid management are rather dangerous concepts after all. “But the political chatter around ‘baseload’ is too often constricted to a narrow range of options. It is a code word for slowing the switch to renewables and keeping faithful ol’ coal on the go. Landline phones are powered by the Central Offices. COs have battery backup. The batteries are finite – they can only carry the system for a few hours. Storage doesn’t produce electricity. Ipso facto, storage can never fix the intermittency of wind/solar. Storage can only dampen it. Your dream is illogical. Maybe ask Holland why they discontinued use of windmills for grinding grain generations ago. Errm, you found out about Cornish steam engines, and comissioned the manufacture one of the largest ever made – the Crusquius pumping station, with nine high pressure cylinders surrounding a central low pressure cylinder. It took three of these pumps five years to drain the massive Schiphol polder, which is now home to the international airport. The Netherlands NOT Holland. It is the same mistake people make when they talk about England and mean Great Britain. What’s wrong with asking Holland? The rest of the Netherlands had less to lose when it came to land reclamation than Holland. Who needs reliable electricity when debt and creative monetary stimulus are the new normal? Wind turbine farms can provide inertia and frequency support to a network, but only with additional equipment beyond the turbines and immediate equipment. My understanding is that in SA the wind farms provide no inertia or frequency support–they opted of such, nor do they provide any reactive power–all of this comes from synchronous machines. I suppose these are all located in Victoria which means needed frequency support and reactive power is all imported, making SA grid itself weak. It takes nearly forever to run through a full analysis of why a blackout occurred. I’ll bet a final report isn’t available for 18 months. But too much displacement of the value that synchronous machines add to system stability by wind farms which provide no such value is a first place I’d look. Darn it, “opted out of such”. No, they aren’t all located in Victoria. Fig 3 here shows that about 400 MW was being generated locally from fossil fuel just before the outage – gas/deisel, with a big part the Torrens Island gas generator (1280 MW capacity). You would give a kidney for it not to be related to the wind generating bird killers wouldn’t you Nick? It is interesting to watch Nick go all denial. Scroll down to the end, where you will find they are quoting some group called the Climate Council who insist that blaming renewables is just politics, “opportunistic and irresponsible”. They then immediately follow that by blaming the climate change for the storm intensity and insisting that it will only get worse if we don’t do something. Now that’s how you do propaganda , these guys should be selling ice to Eskimos and sand pork to Arabs ! Good one observa. It is their propaganda arm Robert but it’s also a cheap blog setup to get re-employed once Labor/Greens take the Treasury benches again and the good oil flows, only this time via their new ‘independent’ artifice. They simply become the defacto Climate Commission again with jobs for the boys. Hmm, Simultaneously hold the belief that opposing climate change “action” is “Just Politics” but promoting Climate change “action” is not. Isn’t this the inconsistent contradictory beliefs that Lew tells us is the mark of a climate denier conspiracy theorist? ….OMG…You are getting desperate ! So now we know that “once-in-fifty-year weather events” will cause a statewide blackout. Nick seems to take solace in this, but we don’t know if a “once-in-twenty-year weather event” could produce the same result, or even a “once-in-ten year”. “Once-in-fifty-year weather events” are the empirical upper limit of the grid’s robustness, not the lower. One in 50 year event huh? That means it’s happened at least 100 times in the last 5000 years when CO2 was mostly around 280ppm. Let’s return to the safety of the bronze age. Obviously Josh Frydenberg is wrong as there are many references in SA media to this being an ‘unprecedented’ event. Wel done, again, the MSM in beating up a story. What is it with the lightning strikes? These are an everyday occurrence and don’t ‘batter’ anything because everything is protected against lightning strikes. Isn’t it? If there is some part of the SA grid not protected against lightning heads should roll. Similarly, if windmills are not protected against lightning then more heads should roll. If this is AGW lightning that is somehow different from other lightning I think we need some serious study because all airplanes are at risk from lightning strikes. I think the lightning strike business is an attempt to distract from the fact that the winds weren’t that strong so it might make the excuses for the various failures a little too difficult to sell. Oh dear, what a credulous little chap you are, Stokes. If a politician says it, it has to be true. And the more elevated the politicial, the truer it must be. Lightning proof grid… That’s a good one. Oh yeah, I mean, we get tornadoes all the time here…… If this storm wasn’t as intense as they made out, then why was it only this time that the transmission towers got knocked down. Surely it would be a common occurrence if a storm like this was a common occurrence. @Nick. An amazing amount of whataboutism is directed at you. I don’t think they realize what a stark contrast they show, and how obvious their bitterness is compared with your continued efforts to be reasonable and argue in good faith. 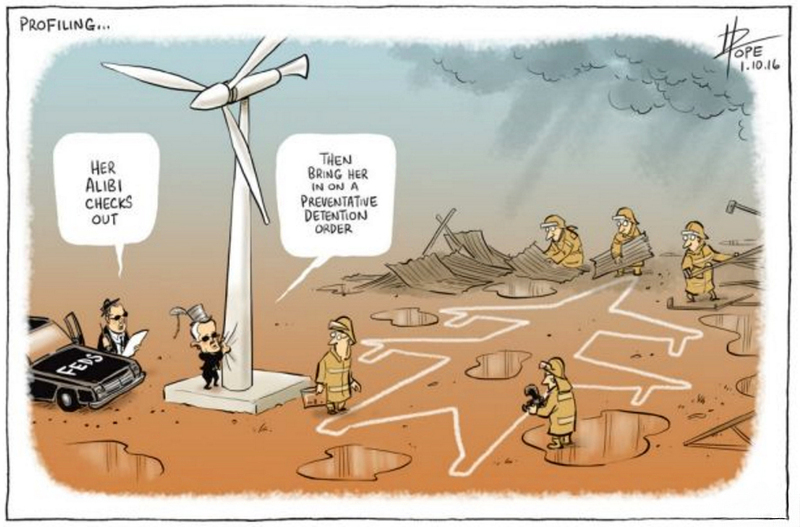 Vagaries of wind turbine toys aside, the catastrophe could have been contained had coal fired power been on tap. It wasn’t because the certifiably mad nincompoops running the joint got rid of all the lovely CO2 emitters. ALL of them. Port Augusta was the last one to go. Green insanity rules. Black start capability is on simple cycle gas turbines (some of them) and diesels. Hydro of course can do it as well. Of course coal plants can have black start capability, if they have startup generators. Many do. James, you are saying that cola fired plant(s) may have a different generator (diesel?) in premises. So diesel has a black start capability, it’s power output is used to start the coal fired plant. I don’t see a contradiction here. Coal fired plant cannot black start, it is not “black” when it starts. With all honesty, it has to be a relatively small plant to have diesels large enough to start it. Captive diesel generators that provide start up MW for auxiliaries are indeed for and part of black start capability of coal plants, black start meaning only that no or insufficient backfeed MW from the grid is available. It is quite common even for 500 MW coal thermal units, though of course more costly. No need to try to hive off critical equipment from a coal plant to further an invalid point. Coal is so too black . Not on this occasion. The most damaged line was the one joining Port Augusta, the site of the coal generators, to the rest of the market. Those stations would have been isolated. Australian Energy Council chief executive Matthew Warren said due to the power station’s closure the state would have less back-up energy available on days of peak demand. He said the state would have a greater reliance on renewable energy and on the inter-connector from Victoria for base-load power. “The reality for South Australians is that we’re in uncharted waters,” he said. Still waiting for your explanation why the STATE of QLD doesn’t blackout, and/or the STATE of NSW blackout during a cyclone or east-coast low? Not to worry. The Guardian has informed us that the blackout was caused by power line failures, not wind turbine failures. It is settled then. No? So, let me get this straight; CAGW is going to make storms more intense and frequent, so the solution is to replace all the sturdy gas, coal, and nuclear plants with fragile windmills and solar panels? “Did climate change have something to do with it? Climate change is fuelling more frequent and severe extreme weather events, including storms. Climate Séance is like that as you know. You get up in the morning look out the window or flick on the weather report and then relate it all to climate change for your palls in the meeja. Yes, Paul – that’s the plan, along with making electricity so expensive noone will be able to run airconditioning to help cope with the blistering heat. It hasn’t occurred to the goofy green blob that it’s cheap energy that makes extreme weather survivable for us. Psycho anarchist Demagoguery Party here wants to get rid of air conditioners. I guess we are all supposed to move to the beach. But they want to get rid of refrigeration as well, so it is rotten food for the masses. I ‘spose we could start with Hillary’s and move on from there. What was it that caused her “Fainting Attack” – Oh yes, overheating wasn’t it. ‘Call me Ishmael.’ The hunting of the great white elephants. Well, if this is the new normal for that area, it’s not difficult to predict what will happen. What would you do if you lived there? Buy your own back-up generator, of course, and have a small stockpile of appropriate fossil fuel. Hospitals already have them. Government buildings would soon purchase them (can’t have politicians sitting in the cold and dark). Then businesses, universities, arenas, etc. Before long, generators would be as common as central hvac systems. Then researchers can study how much additional CO2 is released every time there is a problem, and perhaps propose that CO2 levels could be reduced if the government built NG power plants to carry the baseload and stabilize the grid. What’s wrong with a bit of intelligent management? BOM, with their radar and satellite data knew where the high winds were and where they were heading. All wind farms in the likely storm path should have been closed down and the output picked up by gas stations, all done quietly and purely as routine operations! The greens should be happy, SA emulating North Korea, both would have had the same black hole look from space. And equally predictably, they’re wrong. In February this year I waited 5 hours in the Royal Adelaide Hospital waiting for treatment for a throat infection that was obstructing my breathing. Then I gave up and walked back to the hotel. But I have to confess that I read with a peculiar satisfaction (and not much surprise) that the RAH was the one hospital whose power backup failed and went entirely without electricity during the blackout. With green-stupid energy policy on the rise everywhere, this feast of schadenfreude is just beginning. Exactly. Wind power generation is proportional to the cube of the respective windspeed (v**3) which will create huge variabilities when there are huge speed variations. The greens fall back in pretending that with more turbines the variances are distributed and therefore in average we have less not more problems the more turbines are there. The reality is that wind is mostly consistent over large areas, it is not a huge storm here and peace 100 meters away. This creates huge zones of variability with bursts of power as the graphic shows. Imagine the horror of the other power supply to compensate for that mess. One can control and steer the turbines, but there are limits to it. In addition the producers are greedy and would like to get max produced even if it creates problems in other areas, especially with the ‘green’-distribution priority. I imagine it is not without reason that the germans announced recently the population to prepare backup food and water for 10 days at home. There seem to be that ‘some people’ expect there will be more power supply failures and more often. Yes, excellent case of nominative determinism but nobody beats our (former) Lord Chief Justice Lord Judge. Interesting article, I am not against the right type of renewables in the right place, but they are a mature enough industry now to meet the basic requirements of providing low cost and secure energy. You don’t need hacking skills to destroy a grid. A couple well placed bombs along multiple transmission lines detonated simultaneously will cause far more damage and take longer to fix. Bombs? A simple bicycle thrown in to a substation will do same. Forget about butterflies of West Africa or Brazil, it is butterflies of Ethiopia. BBC Weather’s Tomasz Schafernaker takes a look at the formation of Cape Verde-type hurricanes and where their energy comes from. In the end renewable energy will make energy unaffordable for ‘We The Taxpayer’ who paid for it. I suppose that’s their goal. Pylons can fall (there can always be unusual weather events) but grids should able to cope. That the whole South Australian grid blacked out is due to lack of synchronous inertia being online at the time when the Heywood interconnector to Victoria was lost (this itself was due to the lack of online synchronous inertia). Portions of the grid where the pylons collapsed should have been isolated and blacked out but the grid as a whole should have coped, especially since most of South Australia’s thermal generators are located quite close to Adelaide (nowhere near any of the pylon collapses). The windfarms did not directly cause the blackout but they did set the operating conditions through the effect of their price subsidies which led to the blackout. The renewable crowd are using the fallen pylons as an excuse to demonstrate the fragility of traditional power grids so they can spruik batteries and PV and microgrids. It’s all a smokescreen tactic so don’t fall for it – pylons can fall but grids should able to cope. This very serious problem was been known for a long time – since at least 2005 and probably for decades. There was a near-grid crash in Germany due to wind power on Christmas Eve, 2004, as cited in my post below from circa 2005. Some of them believe that grid-scale storage is a current solution – it is not. Imagine if the grid actually crashed at Christmas in Germany, instead of a near-miss. It would have been a disaster, costing billions due to frozen pipes, etc., and much human suffering. Imagine if that happened in a colder country, like Canada, or the northern USA. Source: Wind Report 2005, by E.On Netz, then the largest wind power generator in the world. Here is a quotation from Wind Report 2005 by E.On Netz for the German wind power grid. As you can readily surmise, wind power is a huge problem for grid operators. Within just two days, the entire generating capacity of German wind power disappeared, necessitating the startup of the equivalent of TWELVE 500 megawatt coal-fired power plants. During the steepest drop on December 24, 2004, they lost the equivalent of one 500MW power plant every 30 minutes! The truth is that wind power requires 100% backup from conventional power sources, a duplication of resources that makes wind power entirely uneconomic. The feed-in capacity can change frequently within a few hours. This is shown in FIGURE 6, which reproduces the course of wind power feedin during the Christmas week from 20 to 26 December 2004. “Whilst wind power feed-in at 9.15am on Christmas Eve reached its maximum for the year at 6,024MW, it fell to below 2,000MW within only 10 hours, a difference of over 4,000MW. This corresponds to the capacity of 8 x 500MW coal fired power station blocks. On Boxing Day, wind power feed-in in the E.ON grid fell to below 40MW. Yes, AEMO data shows that even if you add Vic and SA together the total output can go from under 200 MW to 2200 MW within a couple of days. A 3 to 4 day ramping from near zero to near max where the max peaks are typically 60%-80% of the boiler plate rated value. So Allan’s comment about needing 100% back up capacity seems pretty fair. Sounds like an engineering nightmare. However, if we can keep a nuclear reaction in criticality without it getting out of control ( most of the time ) I guess we should be able to keep the grid from falling on its arse. My guess is that engineering requirements have been over-ridden for economic constraints and quite likely some mismanagement of the backup capacity which does not seem to have been ready to roll despite ample warning of arrival of a major storm. Like cloud seeding Tassie just a day or two before a major storm hit and thus exacerbating the ensuing flooding, it seems like good old fashioned incompetence is also a player. There will be months of manoeuvring and buck passing of this one. Should be interesting. No. The truth is that ALL energy supplies require 100 percent backup. Just ask California when two nuclear reactors at San Onofre were shut down, dropping 2200 MW off the grid. And again, when more than 900 MW of nuclear power in Phoenix, Arizona (that flows to Southern California) is taken offline for various reasons. Wind power is economic where the wind resources are sufficient, and installation costs are reasonable. In the Great Plains of the USA, wind resources are very good and installed costs are low; this yields a reasonable return on investment when the wind power plant obtains $43 per MWh (US dollars). At this time, $20 per MWh is provided by the utility purchasing the power, and $23 per MWh is provided as a tax credit on federal taxes. o Finally, annual average capacity factors for 2015 are higher than ever, at 41.2 percent among projects built in 2014. The statement that wind power is entirely uneconomic is blatantly false. You forgot the sarc tag. The federal tax credit continues at $23 per MWh. Only your Roger, could claim that wind is economic while noting that over half its revenue comes from tax credits. No. The truth is that ALL energy supplies require 100 percent backup. Once again with the contrived misdirection. Operating a grid where large power plants may go off line does in fact require backup sources to maintain service. But they go off line over large periods of time, and when they come back, they are stable. But this is an entirely different matter from wind power which is unstable WHILE OPERATING,on a second to second basis and forces all other power sources connected to the grid to compensate for the instability of wind, and your false economics don’t even begin to take into account the huge costs to that infrastructure. What are the differences between 100% standby backup, reserve margin, and capacity shortfall due to extraordinary non-repeating outages. None? In Southern Alberta, we have some of the most consistent winds on the planet, due to the Crow’s Nest Pass, a gap in the Rocky Mountains to the west. Wind power is paid 20 cents/KWh and receives this 24/7, even when the wind power is not needed – then we give the power to neighbouring states for free. Reliable coal or gas-fired power typically gets 2 to 4 cents per KWh. Do the math. Re backup, see below. Substitution Capacity is the key factor, and it is probably about 5% in Germany in 2016. That means they have to install 20 units of wind power to permanently replace 1 unit of coal or gas-fired power. The economics are dismal. The same story applies to grid-connected Solar Power (both in the absence of a “Super-Battery”). This was obvious to us decades ago. Above is an excerpt from previous post on land-based wind power. The real issue is not Capacity Factor – it is Substitution Capacity, due to intermittency. Forcing expensive intermittent wind and solar power into the grid ahead of less expensive reliable (and dispatchable) power from gas turbine generators is part of the game to artificially bias the alleged economics in favour of wind and solar power. Without this charade, wind and solar power would cost much more than is alleged. The concept of forcing non-dispatchable wind power into the grid while idling much cheaper dispatchable power is simply a way to fool and defraud the public. It got worse. In October 2008, wind power in Germany fell from 16GW to 2GW inside 12 hours. I won’t hold my breath waiting for Nick Stokes to come along and rebut (let alone refute) that statement. The refutation is simple: the aim is not be “economic”. False premise. The aim is to “save the planet” from carbon based life forms. The only good carbon is dead carbon : “keep it in the ground”. The dollar relation is a proxy for energy relation. Bottom line, the energy consumed to design, manufacture, install, maintain and administer renewables appears to exceed the energy they produce in their lifetime. Without the energy provided by other sources these renewables could not exist. No. See my reply earlier to Allan MacRae for the correct wind power economics. The one where you admitted that over half the revenue to wind power comes from tax credits? See my reply to your reply. RS – A typical error in an assessment is failing to realize that installed cost per mW uses nameplate power while average delivered power is much lower (capacity factor approx 40%). Wind power can not be used to back up wind power because there may be no wind at the backup either. Nuc and coal plants can’t be used for backup for wind because they take days to bring up to power. Wind turbines are an unpredictable nuisance to power management. The profoundly relevant factor is energy Wind turbine installations consume about as much as they produce. Investment ends when the subsidy (thanks to our misguided politicians) ends. RG – The subject is energy. “Wind turbine installations consume about as much [energy] as they produce [in their lifetime]. The article you refer to is not relevant. Noone needs that small amount of energy, most is lost in transport. The blades rotate to get the subsidies money machine going. Boys, this is why free markets are good. If this were a free market, the companies would pay for their failure to provide the product as advertised. In a socialist system, the failures will just get more money. All these people arguing. A waste of time. Failures have to go away. For a similar reaction, look at the financial fiasco of the ACA in the United States and reflect. Remember, the Soviet Union collapsed from its economic backwardness. So did the Ottoman Empire. People never learn. It is noteworthy that California has much more wind power installed (8,000 MW) than does South Australia, also has strong storms, and also is connected to other grids. Yet, California has not had a wind-related power blackout. Where a technology is implemented successfully in some locations, but fails in another location, one must not blame the technology. The place to look is at the designers and system operators that failed to account for significant and material factors that led to the failure. You are wrong, because it is penetration that matters for reliability. 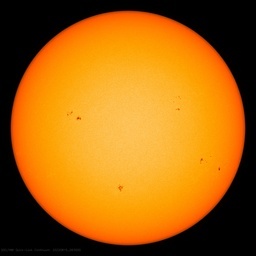 Unless a grid has easy flex sunchronous generation (e.g. ontario hydro), penetration beyond 10-15% is very risky. That is because most grids operate on 10-15% spinning reserve margin to insure sufficient grid inertia tommaintain frequency. (When load increases, a generator wants to slow down. The inertia of large rotating generator mass buffers this until more power is added.) California wind plus solar is 12.3 percent penetration, so wind bynitself is under 10%. SA wind is ~40%. Wind provides little to no grid inertia depending on turbine type. As detailed analysis from grid engineers is showing, it was not the loss of transmission pylons that caused the statewide blackout. (That would have been local blackout and contained.) It was high wind caused automatic wind turbine tripouts and feathering as easily seen by Snowtown. There simply wasn’t enough grid inertia to maintain frequency. The off line gas units could not spin up fast enough, so the Haywood interconnector tripped off to protect the Victoria generators, and that tripped everything else in SA off automatically. Classic rapid cascading blackout. To have 40 percent wind knowing that high winds would force some turbines to feather, without having 20-30% spinning reserve was just asking for trouble. And OCGT isn’t really spinning reserve, especially when switched off. Basically the spinning reseve was the ~500Mw from the interconnectors, compared to a load of >1100 Mw. Just nuts. And SA had been warned about it in writing in February. Where a technology is implemented successfully in some locations, but fails in another location, one must not blame the technology. And yet Roger, Mr. Anti-Nuclear-Activist-Extraordinaire, that is precisely what you do in your arguments against nuclear power. California is also big enough to bully power suppliers, such as British Columbia whicho helped keep the lights on during the 1998 brownouts, for cheap prices after the sale. Despite winning against California’s $3+ billion lawsuit at every level until the last, BC settled for $750,000,000 (as the alternative of losing to a state with many more lawyers than all of Canada) to avoid a possible judgement costing every man, woman and child in BC nearly $1000. You ignore the relative sizes of the Californian vs Sth Australian grids. 8,000 MW is about double the installed Sth Aust wind capacity whereas population and, even more, demand is about 15 times. Also California has much more connection to other grids than the 2 interconnectors in Sth Aust. It should be obvious from this that California has not yet reached the degree of vulnerability that Sth Aust has just seen. I am a structural engineer and I am surprised that 22 transmission towers collapsed during a 1-in-50 year wind storm. This is very unusual – buildings and other structures in Australia are normally designed to resist a 1-in-1,000 year wind event. I can only suggest that there were other contributory factors (additional to wind) that caused so many collapses. There were reports of tornados. The BOM’s wind records may not show these isolated extremes if they don’t blow over a gauge. “23 towers in five locations, affecting three major power lines, were lying on the ground, ripped out by the storm. “So, what did cause South Australia’s blackout? It has everything to do with wind – because that’s what blew over the transmission lines. But it has nothing to do with South Australia’s wind turbines. Unfortunately for Griff, the people writing for The Conversation had not read the AEMO Preliminary Report on the Blackout, which was published two days later. It was clear that faults occurred on transmission lines. Single phase faults occurred and the lines were disconnected, then they came back on line. When a double phase fault occurred the line was shut down. Electranet safety procedures require the line to be checked before resuming operation. A transmission tower falling would have meant a three phase fault to earth – none occurred before the first four wind farms went off line together. This is easily explained by a gust of wind causing all four close by farms to suddenly shut down. This lost 123 MW from the system. Six seconds later another two farms in the general area also shut down, losing another 192 MW. Total 315 MW lost. The Heywood Interconnector had been delivering about 500 MW, then the lost generation from the first set of farms was replaced by the Heywood connector, where the flow increased to about 700 MW. After the second set shut down, the flow wildly fluctuated, rising to nearly 900 MW, then decreasing. When the SA frequency dropped (near constant load, substantially reduced supply) the interconnector lines tripped, and point two seconds later the entire SA system shut down. Had there been more thermal power stations on line, and fewer wind farms, it is plausible that the stability from the thermal stations would have enabled them to withstand the sudden loss of power. Had the interconnector been rated for 1200 MW instead of 600 MW, it could probably have withstood the loss as Victoria would have provided the power – albeit the frequency over the grid would have dropped further from the 49.85 Hz it was operating at. Had the SA system been provided with selective “load shedding” trips, it is plausible that sufficient load would have been dropped off when the wind farms shut down that the interconnector flow would not have risen so far, and its trips would not have operated. Remember ‘load shedding’ was standard practice in the UK when the power demand got too great. First frequency was reduced, so that the grid ran at, perhaps, 48 Hz during the day, made up by running at 51 Hz during the night, but if things got too bad selected areas were shut down, so that housing suddenly lost power, while trains, trams and trolleybuses, and hospitals and the like kept going. Candles were a standard household item as one neven knew when one would be affected by ‘load shedding’. Why is the Excess Winter Mortality Rate so high in Australia? Has this anything to do with their very high costs of energy? Or is it the failure to adapt to cold weather in a warm country. Winter Mortality Rates are lower in Canada and the Scandinavian countries than in Australia. Annual Capacity Factor in land-based wind power systems rarely exceeds 30% and is often about 20%. Capacity Factor in the large E.ON Netz system in Germany in 2004 was 18% (=1295/7050). “At the end of 2004, wind farms with a total installed capacity of around 7,050MW were connected in the E.ON Netz control area, accounting for 43% of total installed wind power capacity in Germany. 1. The highest wind power feed-in in the E.ON grid was just above 6,000MW for a brief period, or put another way the feed-in was around 85% of the installed wind power capacity at the time. 2. The average feed-in over the year was 1,295MW, around one fifth of the average installed wind power capacity over the year. As stated previously, the more important factor is Substitution Capacity, which is the amount of conventional power generation that can be permanently replaced by wind power. This factor was 8% in Germany in 2004, and is projected to drop to 4% in Germany by 2020. “In order to also guarantee reliable electricity supplies when wind farms produce little or no power, e.g. during periods of calm or storm-related shutdowns, traditional power station capacities must be available as a reserve. This means that wind farms can only replace traditional power station capacities to a limited degree. An objective measure of the extent to which wind farms are able to replace traditional power stations, is the contribution towards guaranteed capacity which they make within an existing power station portfolio. Approximately this capacity may be dispensed within a traditional power station portfolio, without thereby prejudicing the level of supply reliability. In 2004 two major German studies investigated the size of contribution that wind farms make towards guaranteed capacity. Both studies separately came to virtually identical conclusions, that wind energy currently contributes to the secure production capacity of the system, by providing 8% of its installed capacity. As a result, the relative contribution of wind power to the guaranteed capacity of our supply system up to the year 2020 will fall continuously to around 4% (FIGURE 7). Sorry, what about the fluctuations in power consumption? Is there any data available? I’m very sure that they are much bigger than the 100 or 200 MW of this wind farms! Thomas – you must do adequate research before you can be “very sure” of anything. When fluctuations in grid power supply and demand are predictable, like breakfast and dinnertime peaks and seasonal variations, they can be managed much better than unpredictable sharp declines like those experienced in South Australia recently, or Germany at Christmas 2004. It is the unpredictable extreme changes typical of wind power that cause the gird to crash.